We enjoy getting to know our readers and are always on the lookout for great, inspiring sports stories. Write for Sports Feel Good Stories by following the “What We Look For In Stories” guidelines below. If you’d like to write for us, here are a few things you should know. We like personal stories featuring athletes performing good deeds, overcoming obstacles or demonstrating sportsmanship. We also like stories that introduce readers to new sports, e.g., kick volleyball, or different sports experiences, e.g. the experience of attending your first basketball game at Allen Fieldhouse for a KU basketball game. And, we always welcome stories from content experts that fit the general theme of our site. If you have photographs or videos to include with your story (and you own them), please include. All the writing and visuals must be original and not previously published. We like stories in the 1,000 to 2,500 words count range. Our sweet spot is about 1,500 words. With that noted, if you’ve covered everything about the story in 800 words and it stands on its own, please submit that without adding fluff. Sorry, we don’t swap stories for links out to other websites. But, we do pay for stories we publish. Please suggest a title for your piece and subheadings to break up the text and make it easier to read. Please know that we may change these, along with editing some of the text. Please use Microsoft Word to submit your proposed story. If that doesn’t work, just include it directly into your email. 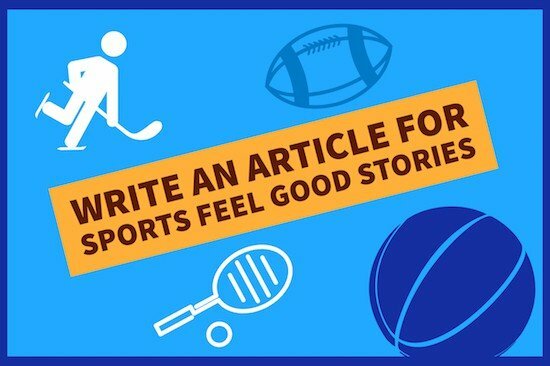 Please email your proposed story to editor (AT – use the symbol)SportsFeelGoodStories.com. Include a phone number to reach you at. If we like it, we’ll contact you by phone or email to make an offer. If it’s not a good fit for us right now, we’ll let you know by email. One of the most rewarding aspects of publishing inspirational stories is that they do seem to have a very positive effect. Folks who read about inspiring stories frequently mimic the behavior, and the world is a little nicer place to live in (we think). We’ve been accepting a lot of stories from many different sources lately. If you have something you think would be a good fit, write it up and send it our way.